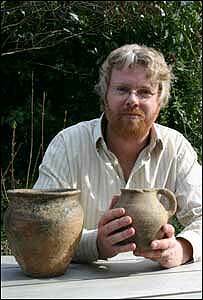 Two Roman burial urns have been found on the grounds of a retirement village being built in Tregony, Cornwall. The 1st century AD pottery urns were found by a Cornwall County Council archaeologist in a pre-construction check at the Roseland Parc development. Experts believe the urns were recovered from a shrine that overlooked Fal River. They are to go on show at the Truro Museum after analysis. A council archaeologist said it showed Romano-British burial practices. The council's senior archaeologist Andy Jones said: "Although Roman period cremations in pots are fairly commonplace in southern England, the find is highly unusual in Cornwall." Burials dating to this period were rare and "almost unknown", he said. "The discovery may point to the adoption of burial practices from elsewhere in Britain by the local inhabitants or perhaps it was the grave of someone from outside the county," added Mr Jones. The excavation was funded by the owners of the £20m development, which is set in a wooded area in the centre of Tregony.